We have decided to donate all the money earned from Phone Story, around six-thousand dollars, to Tian Yu, a former Foxconn worker who attempted suicide. Since we released Phone Story last September, the "dark side" of electronics manufacturing became a prominent issue in the public debate. Thanks to a series of articles in the New York Times, an hour long episode of This American Life dedicated to the issue, and a wave of reporting from mainstream and grassroots media, the abusive working conditions at Foxconn are now in the international spotlight. However, we rarely see the issue framed in the context of planned obsolescence and electronic consumerism. Even more rarely is it connected to other problematic issues such as Coltan mining and electronic waste disposal. The unusual attention to the Foxconn case is partly due to a broader debate around de-industrialization and the related unemployment crisis in the West, and in part due to the moral high-ground that Apple has achieved in the eyes of its loyal customer base. But we can't ignore the struggles of workers and labor activists on the front lines (or, better yet, assembly lines) that force us to reflect on the contradictions of global capitalism. One of these organizations, SACOM - Students and Scholars Against Corporate Misbehavior, has been instrumental in connecting these struggles and presenting them to the world in a concrete way that challenges the shallow promises offered by the PR campaigns of Apple and their contemporaries. Phone Story was supposed to function as a provocative fundraising tool for organizations like SACOM. We wanted to allude to something more concrete than 'raising awareness' and at the same time provide a counterpoint to the obsession of 'monetization' that pervades the community of game developers. Unfortunately, the ban from the iTunes store - just three hours after the official release - kept us out of the most important marketplace for smartphone apps and forced us to rely on the infinitely smaller and fragmented Android Market. Despite the positive reviews and the wide media coverage, the amount of money we were able to collect from sales and artist fees (the art organizations who exhibited the game) was humbling, a little more than $6000 - see details below. 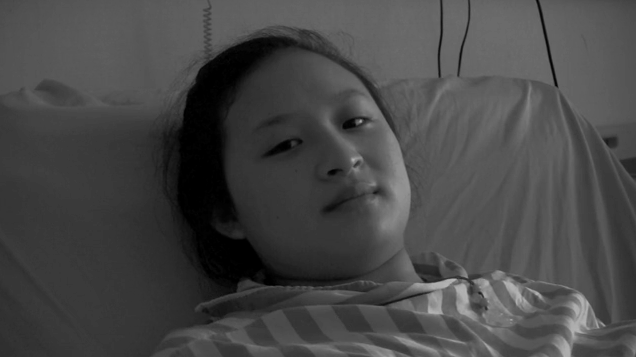 Then we came across the tragic story of Tian Yu, a girl who suffered from serious injuries after trying to commit suicide by jumping from the Foxconn's factory complex where she was working in 2010. She was 17 years old at the time. We thought: $6000 won't do that much to an organization but they could be significant for an individual who used to earn about $130 a month. So we made Tian Yu the recipient of our first donation. Tian Yu in hospital. Image taken from Deconstructing Foxconn courtesy of Jack Qiu and SACOM. Download a zip with documentation of the transactions.